This page provides instructions on how to update the firmware for CMT-SX7 to version MC1.62 / NW2994. Press to hold ENTER and (CD EJECT) on the unit until "MC 1.60" appears on the display. Turn the turning |<< / >>| dial of the unit to the right and "NW 2892" is displayed on the display. If the version is displayed as "MC1.62 / NW2994", it is not necessary to update the firmware. Note: It is not possible to roll back to the previous software version after performing the firmware update. The "CMTSX7V1622994" folder is now open on your computer's desktop. 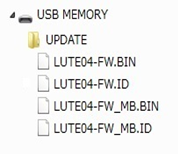 UPDATE folder contain 4 files: "LUTE04-FW.BIN", "LUTE04-FW.ID", "LUTE04-FW_MB.BIN", "LUTE04-FW_MB.ID". The "CMTSX7V1622994" folder is created on your desktop. Copy the UPDATE folder inside it to the USB flash drive. Refer to below image. IMPORTANT: Ensure the unit is not playing back any music before updating the firmware. Press the button to turn ON the unit. Insert the USB flash drive (containing the update files) into the USB-A front port. Please wait until "ROOT" appears on the display. Please wait for about 10 minutes for the download and update to be completed. Press on the unit after "Complete" is displayed to turned OFF the unit. Press on the unit again to turn it on. Do not disconnect the power or network (LAN) cable during download and update of the firmware. Please retain these connections. It may cause failure of the unit if the cables are disconnected. Do not operate on the unit and the remote controller during download and update. Firmware update may fail during the procedure if the network environment is not adequate. In this case, update the software using a USB flash drive.